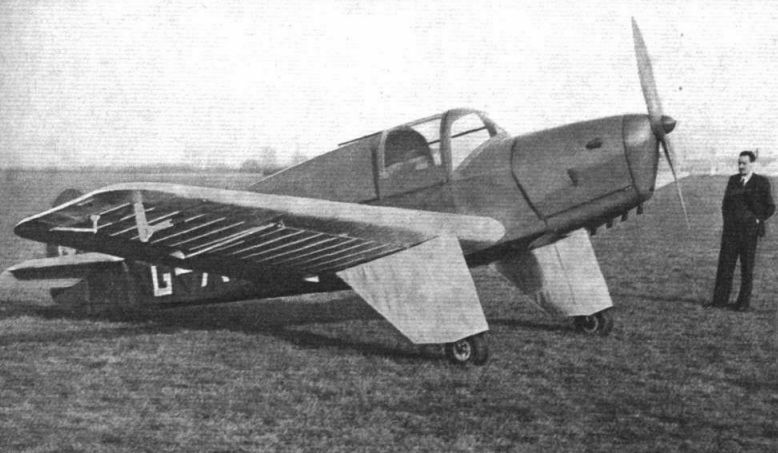 BROXBOURNE AERODROME has lately been the scene of the building and testing of a new light side-by-side two-seater cabin monoplane of wooden ДальшеMore>>> construction. 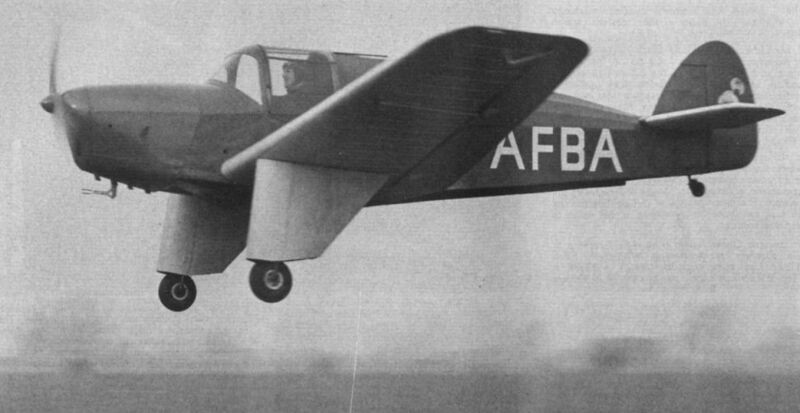 Christened the Knight, the machine is the first product of the Deekay Aircraft Corporation, Ltd., which was formed to explore, among other things, the possibilities of plastic construction. The structural simplicity of the Knight as built in wood reflects the ingenuity of the designer, Mr. S. C. Hart-Still, who has made every effort to keep down the cost, which, according to Mr. J. McEwan King, the managing director, should be in the region of ?650. New premises are to be taken in another part of the country, and it is hoped to have the first production machines coming through by April next year, should Martlesham tests prove satisfactory. According to "Jock" Bonar, who has been doing the test flying of the Knight, there seems to be no reason why they should not be passed easily. 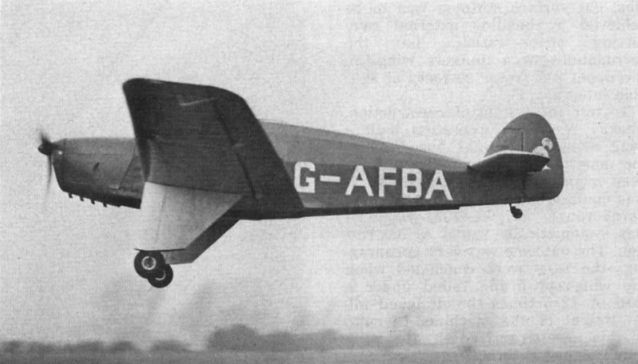 The Knight, according to Bonar, is stable about all three axes; the ailerons are better than on the majority of light, low-wing types he has flown; it has a nice sinking glide even without flaps (these are not being used for the time being); visibility and roominess are particularly commendable; and it is possible to take off and land with the cabin roof slid back. In the first instance, the Knight was designed to take the American Aeromarine radial, but Expansion ruined any hope of producing that engine in this country, at any rate at anything like an acceptable figure. The power unit adopted - the Cirrus Minor - seems quite ideal for the job, and the results obtained lend weight to the belief that 90 h.p. should be ample for a two-seater private-owner type with a cruising speed of rather more than 100 m.p.h. with a range of 500 miles and 80 or 90 lb. of luggage. The wing structure of the Knight has four main spars, which extend to the fuselage centre line, a few diaphragm ribs and three-ply covering. The "box" thus formed is stiffened externally by wooden battens as explained in Flight of July 22 this year. Leading and trailing edges are added as separate units. A portion of the leading edge is hinged to permit inspection of controls and for servicing the undercarriage. The aspect ratio is seven. There is a slight taper and the wing tips are comparatively square cut. The split flaps, which extend from the ailerons to within a foot or so of the fuselage (permitting a welcome foothole to be built into the top surface) have an area of 23 sq. ft. These have not been tested as yet, but are expected to confer excellent approach characteristics. Wrapped plate spars are used for the flaps in conjunction with a sheet of dural and a few stiffeners. Aileron construction employs ply webs and spruce flanges of square section with 8-mm. ply covering. Mass balancing is incorporated. 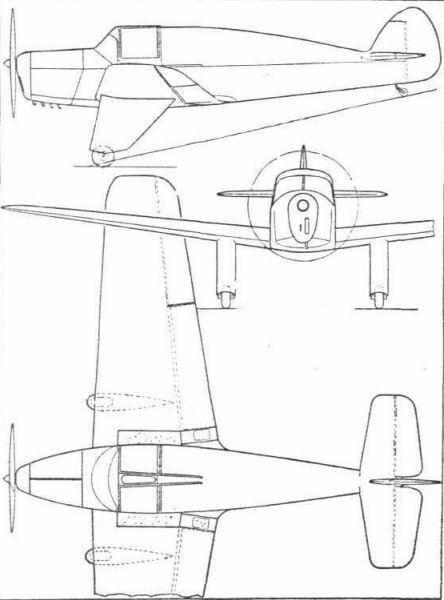 The fuselage has four spruce longerons, ply covering, and spruce diagonals anchored to ply gussets. Ply covering is also used for the cantilever fin, which is built into the fuselage. The top rear fairing section is of fabric with conventional cross frames and stringers. Of Deekay design and construction, the undercarriage incorporates two telescopic legs with steel springs taking compression and an oil chamber taking the rebound. Cross-bracing is by wires and the drag struts are a pair of V tubes, Bendix brakes and Palmer wheels are used. 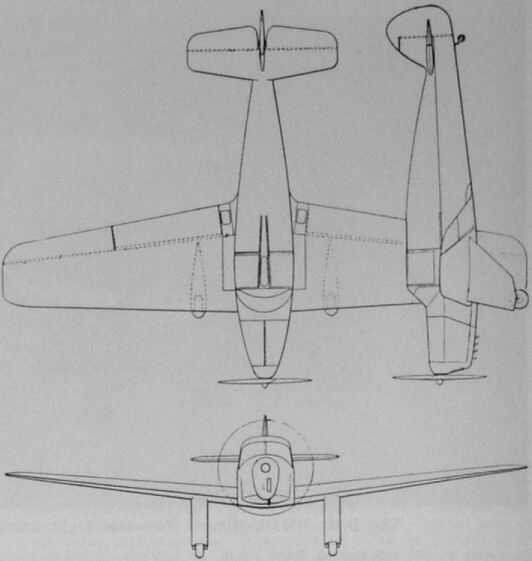 The seating is quite independent of the fuselage proper, and there is a well between the first and second spars to accommodate seat-type parachutes. Behind the seats is a rectangular tinned-steel 20-gallon tank, sitting on the rear spars. Above this is a compartment for 88 lb. of luggage. Dual control is normally fitted, one stick being easily detachable. 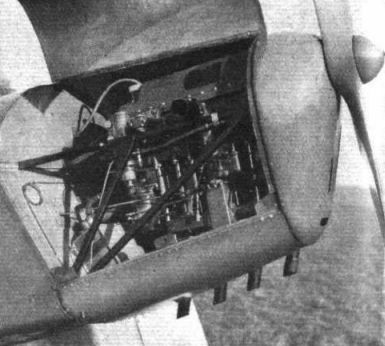 The rudder pedals work on two cross shafts with levers on the centre line operating cables. These levers, together with other moving control parts, are in a central box along with the brake differential unit. Elevator control is by cable to the rear of the fuselage, thence by push-pull rod. 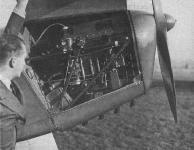 The aileron cables run along the face of the front spar to a bell crank lever mounted on the spar; thence control is by an external push-pull rod. Rudder and elevator controls are grouped in an external channel on the bottom of the fuselage, permitting easy inspection. 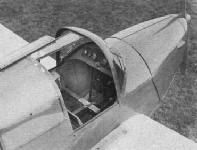 A sprung, fully castoring tail wheel is fitted. Square tubes and flat plates are used for the engine mounting, spot welding being employed. The Cirrus Minor (82-90 h.p.) drives a wooden airscrew. The machine is made by the Deekay Aircraft Corporation, 61, Crutched Friars, London, E.C.3. Leading data concerning the Knight are: span, 31ft. 6in. ; length, 22ft. 10in. ; height, 6ft. 7in. ; top speed (estimated), 125 m.p.h. ; cruising speed, 105 m.p.h. 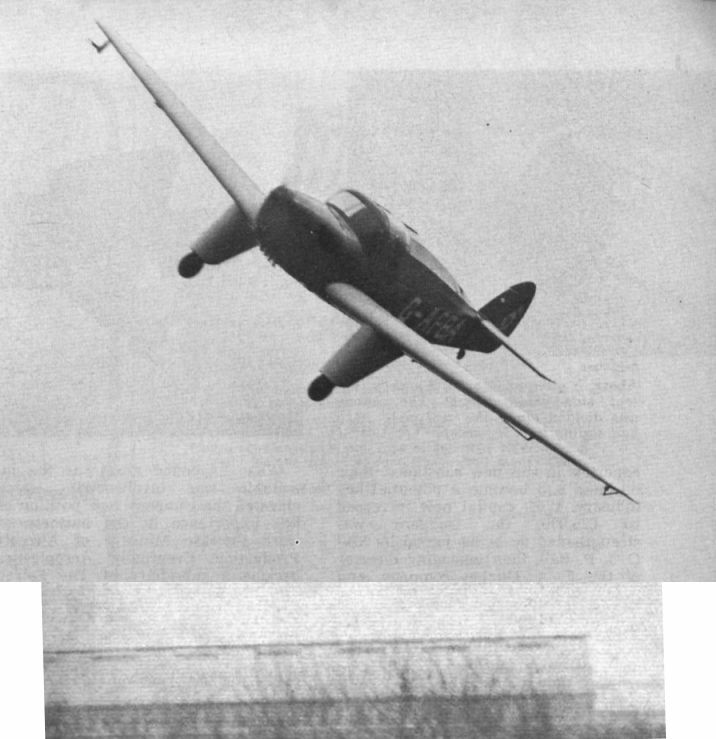 ; landing speed (without flaps), 48 m.p.h. ; landing speed (with flaps), 39 m.p.h. ; range, 500 miles. The Deekay "Knight" Light Cabin Monoplane.